*Take bite*.... Picture of Patrick taking a bite of Krabby Patty in the episode "Nature Pants". 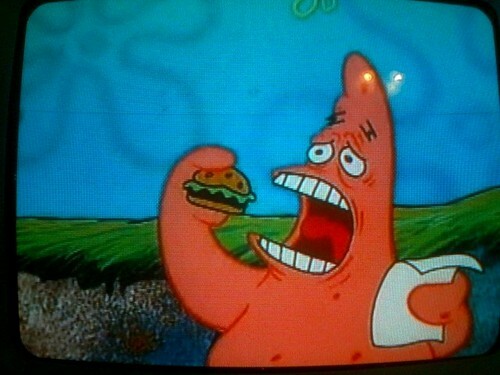 He is sad and misses Spongebob, who ran away to Jellyfish fields, and after Membaca the script Sandy gave him, attempts to take a bite of a Krabby Patty. Hilarious ♥. Wallpaper and background images in the Spongebob Squarepants club tagged: spongebob patrick spongebob squarepants krabby patty nature pants picnic idiot face eat funny. Sandy: Here, Patrick, have a Krabby Patty. *Leans forward and whispers* There he is, Patrick. Say your lines! Patrick: *Looking at script and trying not to burst into tears* Why, thank you, Sandy, I would love one. Take patty. Patrick: I can't do it! Spongebob! Come back! Spongebob: Patrick, I'm not coming home. Patrick: But I miss you. Sandy misses you. Even Squidward misses you! Spongebob: I'm happy here. This is my home now.